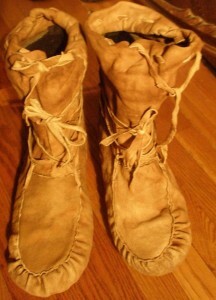 Thomas, how does one sew a second sole onto a pair of moccasins? Secondly, where did you get your rubber-soled moccasins? one of the best ways I´ve found to attach additional soles to moccasins is to cut the additional sole (or soles) slightly bigger all the way around so that they overlap the side of the moccasins by an inch or so. That way the seams are on the side instead of the bottom and wear out much slower. Easier yet would be to just sew a sole to the inside, though I prefer to protect the original moccasin by adding to the bottom. Tar det på norsk, jeg..
Når du behandler skinn, behandler du det med dyrets hjerne eller andre oljer og fettyper? Jeg vet ikke om du har lest bøkene til Jean M Auel. De handler om steinalderen. Mange bra tips for å lage forskjellige ting. I´ve worked with a number of different tanning agents so far – brains are my favorite one when it comes to brain/fattanning (you may have heard about other styles like barktanning or urinetanning, but that´s another story yet). Eggs are fairly good too, and some pelts (like racoons) have a natural oil in them that works well for tanning,so you don´t need to add anything in that case(I just recently tanned a couple fatty racoons with nothing else and they turned out quite soft). I have used some oils like olive oil with limited success, I find that they work better when they´re mixed with eggs or brains. Liver was used in some cultures too for that purpose,though I haven´t tried it before (I usually prefer to eat it 🙂 ). Jeg leste også noe om bruk av ammoniakk. De tok vare på tiss til det naturlig ble ammoniakk og gned det inn i skinnet. Etter dagens normer, ville vel de færreste prøvd dette, og jeg husker ikke helt hva det gjorde med stoffet. tror kanskje det ble mykere eller noe. Beklager at jeg fortsetter med å skrive på norsk, er flinkere til å ordlegge meg på norsk. my understanding is actually that ammonia is both used in traditional urine tanning (ammonia is naturally occuring in urine) and some commercial tanning methods. It´s certainly interesting to see how many ways there are to soften skins…and urine is certainly easily available! Hey Thomas, these are great. I’m a braintanner, forester, and traveler. I love what you’ve done with this website. I’ll be teaching my first braintanning workshop this spring, really excited. Anyway, these boots look fantastic. I’ve been messing around with moccasin designs, but I’d like to try something like your boots. Any chance there’s a design you’d be willing to share with me? I’ve got a bunch of deer skins (grain off) sitting around to experiment with. 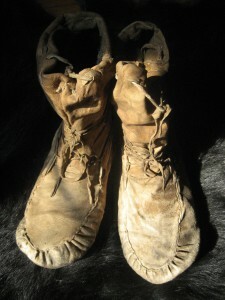 I´ve been doing a fair amount of improvising with my footwear based on some of the styles I saw in both commercial and homemade footwear…both the moccasins and the mukluks I´ve wrote about are of the “puckered-toe” style which was common amongst the Ojibway people, with the typical “puckers” (small folds) along the toe seam as a result of how the sole and the insert are sewn together. 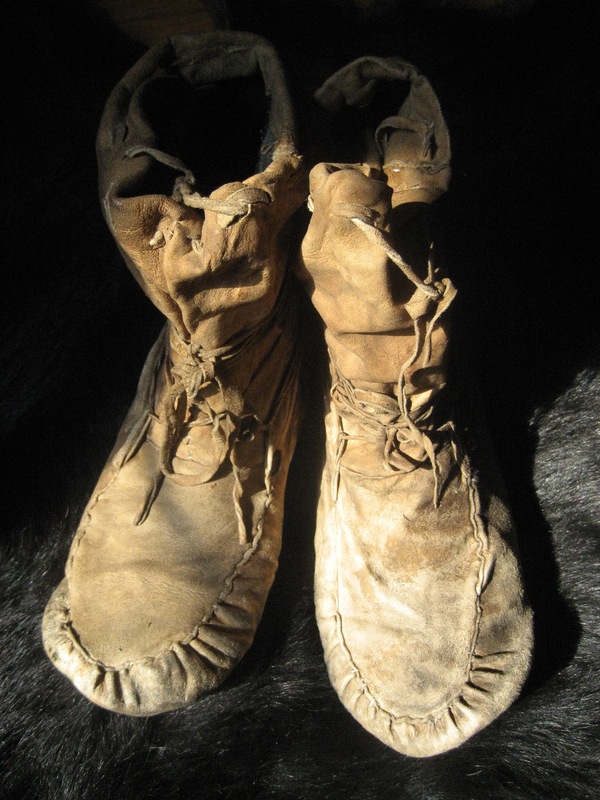 I can´t provide any detailed patterns or measurements right now, although I´ve seen and read a number of different moccassin books that have some of those details. One that immediately comes to my mind is called “Craft Manual of North American Indian Footwear by George M. White” which I can definitely recommend, the other titles I´d have to look up. 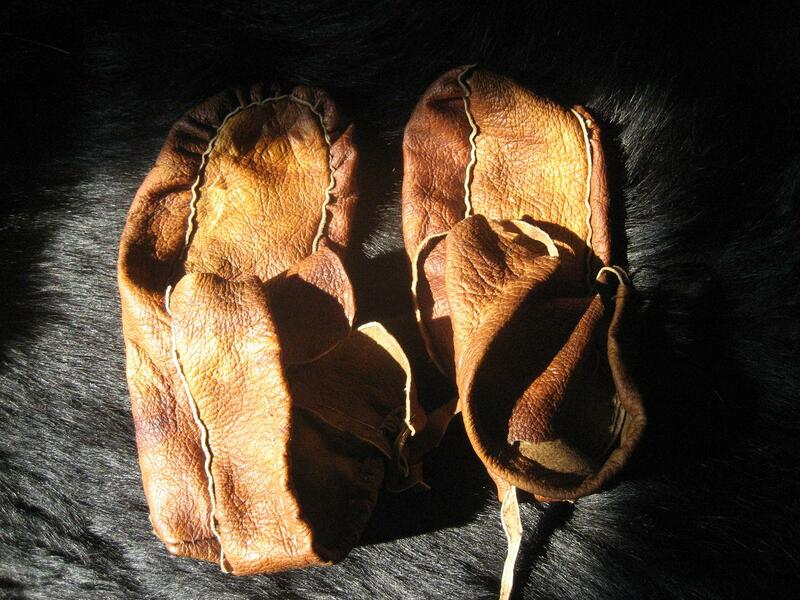 I´m also planning to replace the soles on my mukluks (worn through by now) and potentially make a back-up pair of mukluks for this winter. This time I want to take some pictures of the process too and post them here which might give you a better idea of what cuts etc. I´m using for mukluks. A few pictures can probably explain it much better than I could here in words. Exciting to hear about your barintanning class…let me know how it goes! I am planning on making myself one of these and am going to line them with some sort of a removable coyote pelt sock. Since they will be used only in the snow and on ice, do you think I will be needing an extra sole with the liner.